There are various document converters online that can help you convert PDF to PDF. 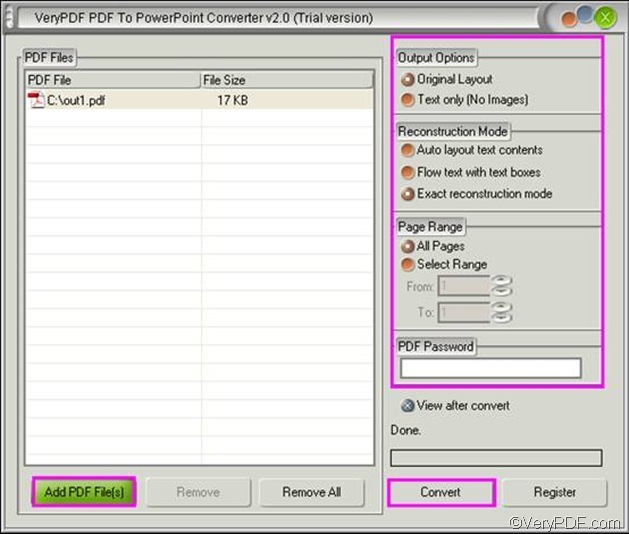 This article aims to introduce a professional converter which is named VeryPDF PDF to PowerPoint Converter. It supports batch conversion from PDF to PPT, and can well maintain the original layout, text, etc. Please visit and download and install it on your computer. Then, you can do as follows to convert PDF to PPT. First, you should input PDF files. Please click the Add PDF File(s) button, and select a file in the PDF2PPT dialog box that pops out, and press Enter. Then, you can view all the added PDF files in the list box under PDF Files. Second, you can set options. If you want to reserve only the text from PDF to PPT, or keep original layout, please click a radio button under Output Options. Under Reconstruction Mode, there are three radio buttons. If you want to flow text with text boxes, you can click the second button in this group. If you click the first button in this group, the computer will automatically flow the text from PDF to PPT. If you click the third button, the computer will try its best to maintain the original layout from PDF to PPT. To set page range, you can click buttons and arrows under Page Range. If the original PDF file is protected by an open password or a user password, you can type the password in the edit box under PDF password. Third, after you set options, you can click the button Convert under the progress bar. Then the Save As dialog box will pop out. Please select a folder and click Save in this dialog box. Then, the computer will prompt to convert your PDF to PPT.